The killer whales around Vancouver Island need our help to protect them from the effects of human activity. 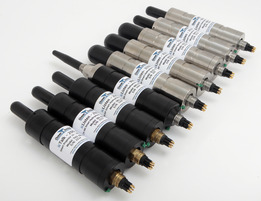 Ocean Sonics has stepped up to the challenge with its novel hydrophone network. Ocean Sonics is excited to announce the release of the newest icListen HF Smart Hydrophone. The SC2-ETH follows the very popular SB2-ETH with its small size and smart electronics, setting the standard for smart digital hydrophones! Large Memory: Double the data collected with the 256 GB internal memory. For even more memory, ask about the New Acoustic Digital Recorder. Enjoy all the icListen features you currently enjoy and more. The SC2-ETH is fully compatible, and can be directly combined with other members of the icListen family. Contact our Distributors or Ocean Sonics for pricing. Available for sale, September 2017. The world’s best digital hydrophone is about to get better and Ocean Sonics is celebrating by offering a promotional price on the icListen HF hydrophone until the end of September! We are excited to offer the current model SB2-ETH (200m) and SB35-ETH (3500m) to users who want the performance of the world’s best digital hydrophone at a great price. Contact Ocean Sonics or your local distributor to take advantage of this offer, while supplies last. Offer expires at the end of Sept 2017. Ocean Sonics has long outgrown their cramped workspace in Great Village. It’s full of too many people, and piled high with boxes of their award-winning icListen Smart Hydrophone. The Business Development Bank of Canada is loosening the purse strings to make an extra $100 million in financing available for Atlantic Canadian businesses in four industry sectors during the next two years. In a bid to boost the information and communication technology, agri-food, ocean technology and tourism sectors, the Crown corporation responsible for helping Canadian businesses is upping its financing envelope for the next two years for those industries to $280 million. “These sectors are areas that we feel have the greatest opportunity for growth,” Michael Denham, the BDC’s president and chief executive officer, said in an interview Thursday. “What we’re looking for are entrepreneurs who have solid businesses in place and who are looking for financing for equipment, marketing or to expand their sales force,” he said. That’s a higher level of business confidence than in the rest of Canada. And it’s an optimism shared by Great Village-based Ocean Sonics owners Desirée Stockermans and Mark Wood. Their five-year-old company, which developed a digital hydrophone that allows users to listen to underwater sounds in real time from the surface, have seen explosive growth. Digital hydrophones are used along coastlines to measure ocean sounds, including marine life and human activity like shipping, commercial and military activities which contribute to noise pollution. Video about the icListen Smart Hydrophone installed in a High traffic area in British Colombia. Ocean Sonics, a Nova Scotia-based designer and manufacturer of digital hydrophones, expects to install its sensoring equipment in the following months for Cape Sharp Tidal project located in the Bay of Fundy, Nova Scotia. An Acadia University research team is unlocking some of the mysteries surrounding the Atlantic sturgeon.